Music is in a good state, music is in a poor state. That debate. You’ve heard it all before. Still, there is something lame starting to be seen in rock bands, the same bands who saved rock a decade ago. Lots of them seem bored while playing their songs, unconvinced, lacking the energy so vital to rock’n’roll. I would be, if the main chorus I had to sing every night is “Come on, come on, come on come on, come on, come on Number one party anthem”. Some bands have unfortunately lost key members (John Frusciante, anyone?) and some are still trying hard to show they’re cool by posting videos of themselves getting wasted on a male night out despite hitting their forties. How will a teenage girl connect to that? The good news is, there are a few new bands today that are worth listening to. They are engaging, you can connect with their songs and they don’t seem to be pretending too hard. It also happens that a lot of them are female-fronted. Do Nirvana or Pixies ring a bell? If they do, you should listen to Bully led by the singer Alicia Bognanno. Although it has this 90s grunge feel to it, this is not a revival band. Bully has their own sound. What makes them special? How many men can talk today about getting their periods? None. But how many women can connect to these words? A lot. The raw passion, energy, rage that the singer puts in her singing should be an example for post-2007 Alex Turner and his mates. Alicia’s voice is so expressive, it reaches your chest and shake you up. The lead singer writes Bully’s songs, write the lyrics and even produce the songs which is so rare nowadays with bands hiring stars producers. This gives her the flexibility to make songs sound exactly like she wants them to. The other musicians in the band are excellent because they use their skills to serve the song rather than using the song to show off their virtuosity. 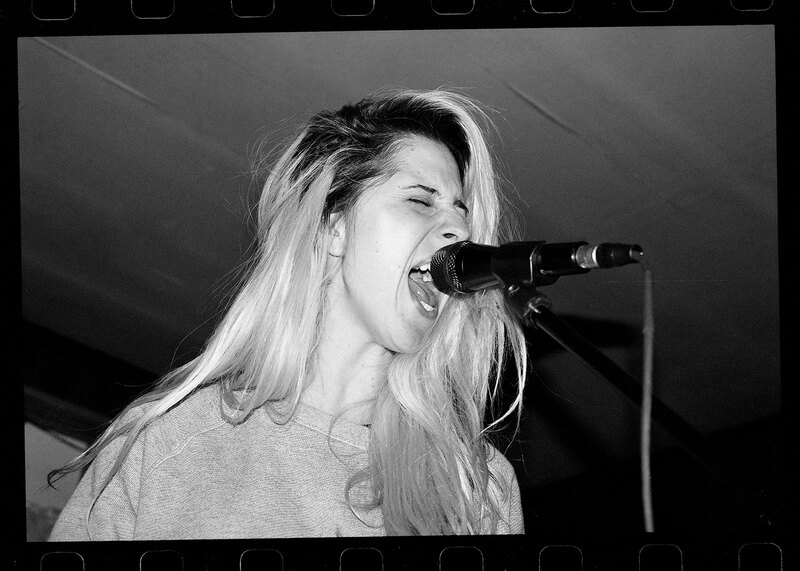 In summary: Bully delivers brutally honest music. It’s hard not to believe or feel the emotions of the lead singer. Listen to: Trying, Trash, Sharktooth or Get me away from here I’m dying (Belle & Sebastian cover). Alabama Shakes have been around for a few years now. 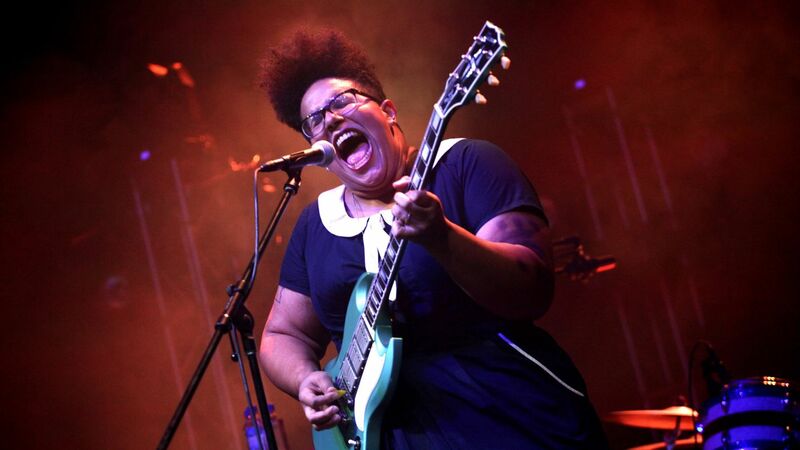 Alabama Shakes’ music is phenomenal, but Alabama Shakes, for me, is The voice. Brittany Howard has probably one of the most beautiful, powerful, expressive, raw, elastic voice of the music industry today. Luckily, she doesn’t sing like Maria Carey-or Britney Spears. It is rare today to see an artist use their great voice to rock’n’roll but Brittany does. How to describe Alabama Shakes music? It is very hard to define. It is country. It is rock’n’roll. It is funk. It is punk. It is dirty. It is slick. But most of all it is real. And I go back home” sings Brittany on Rise to the Sun. Rock stars can moan as much as they want about taking drugs or getting wasted or whatever. But with lyrics as simple, blunt and honest as these four verses, Alabama Shakes have put me in their pocket. Listen to: Rise to the Sun; Heartbreaker, Boys and Girls, Give me all your love. 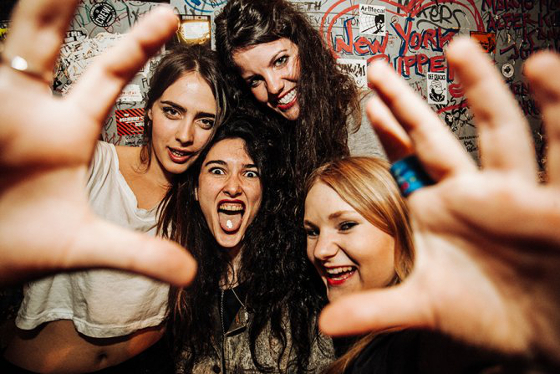 The four girls band from Madrid creates simple fresh songs that make you want to sing along in your bedroom in front of the mirror. When Velvet Underground and Beach Boys get married and have kids in Spain, it does prodigies. Why are Hinds rising so quickly and gaining in popularity? They seem so down to earth, everything but pretentious. They don’t take themselves too seriously, and know where they stand. They don’t take anything for granted. Just follow their Facebook page and see: Lots of exclamation marks expressing disbelief. The excitement is so tangible through their smiles and looks. They’re having the time of their life and enjoying the ride. You feel like you are part of the adventure. Listen to: Bamboo, Trippy Gum, Davy Crockett. A singer called Lois. And three musicians. They set fire everywhere they go with their eccentric glam rock/punk/ pop/ rock’n’roll concerts, even in the middle of an H&M shop in Oxford Circus. Lois is a mesmerizing, energetic, wild performer. With her and the band, you never know what is coming up next. High notes? Low notes? Screams? Wolves singing? 360 degrees spinning? Hair waving? Singing about love? Singing against war and corrupt politicians? You are guaranteed not to get bored watching Lois and the Love live, catch them before they grow too big too fast. Debut Album out in August. Listen to: War, Denial, Carpet Burns, Rabbit Hole. Bully, Alabama Shakes, Hinds, Lois and the Love. A lot of girls in rock music today are refreshingly honest, touching and you can connect to what they are singing about. Rock’n’roll vitally needs this honesty and this raw energy to stay relevant to our generation today.